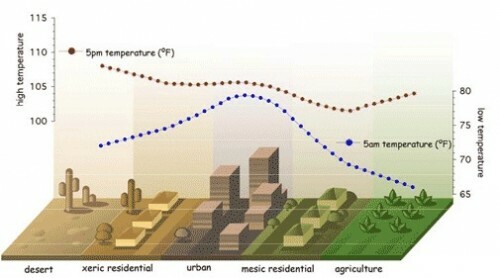 Graphical representation of the urban island heat effect. Image courtesy of Think Green. Go to Google Earth. Now find a city (it may take a couple tries). Notice that the landscape appears gray, not green. Lacking vegetation and coated in asphalt and concrete, a typical city is strikingly different from the surrounding country. This seemingly innocuous observation has some pretty intriguing ramifications. In fact, it causes a phenomenon known to climatologists as the urban island heat effect, whereby dense cities have been empirically found to be up to twenty degrees Fahrenheit warmer than their surrounding hinterlands. According to climatologists at NASA’s Goddard Space Flight Center who have used satellite thermometry to measure the temperature gradients emanating from cities, this heat effect is caused primarily by two factors. First, cities lack plants that absorb solar energy without heating up via photosynthetic and evaporative processes. When combined with the fact that cities are filled with dark asphalt roads that readily absorb light and heat up, it is little wonder that cities are hotter than the surrounding countryside. 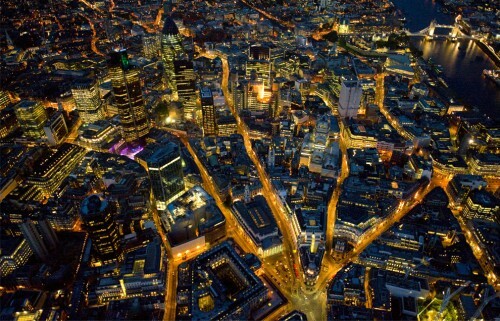 British physicist Geoffrey West’s work suggests that cities can and are modeled as organisms, an idea that has grown increasingly popular in recent decades. Image courtesy of Urban Times. Remember when your high school biology teacher told you to think of the excretory system as a city’s sewers? The metaphor was not too far off. Very much like our own urine, wastewater from the sewers can tell scientists a lot about the city that produces it, including which drugs are popular. In a recent study, epidemiologist Kevin Thomas tested the wastewater of Oslo’s underground sewers once every other week, searching for chemicals indicative of drug use. These chemicals, known as biomarkers, are the digestive products of common recreational drugs such as cocaine and ecstasy. They are important because their concentration can be measured to determine the consumption profiles for cities, using methods analogous to individual drug-tests. For instance, Thomas measured the concentration of benzoylecgonine, a biomarker of cocaine digestion, and plotted its concentration over time. Not only did he discover that Norwegians party exceptionally hard around New Year’s, but he also found that the official police numbers underestimated the prevalence of these drugs on the streets of Oslo. Similar tests in Oregon have also proven successful, providing law enforcement agencies with one more tool in the fight against illegal drugs. The patterns formed by bacterial slime molds mimicked the connections of the Japanese subway system. Image courtesy of Wired. Think of the largest living thing that you know exists. An elephant or blue whale, perhaps? What if I were to say New York City? According to British physicist Geoffrey West, cities are as alive as you or me, and because of this, they must abide by the same rules that govern all living things — most prominently, scaling laws. First proposed in his controversial 2004 paper, these laws quantitatively describe the relationship between an organism’s size and various other physical properties. For instance, he noted that size was sub-linearly related to metabolic need. In other words, an elephant, which weighs 10,000 times more than a mouse, does not require 10,000 times a mouse’s energy; it actually only needs 1,000 times as much. In cities, this economy of scale is also apparent when indicators of urban “metabolism,” such as miles of road or number of gas stations, are plotted against total population. By extending this logic, he has deduced numerous formulas that relate everything from traffic volume to crime rates and average income. Most surprising of all, his equations work — fairly well, at least. 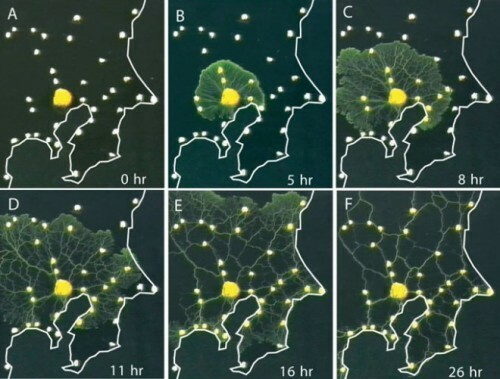 The patterns formed by bacterial slime molds mimicked the connections of the Japanese subway system. Image courtesy of Popular Science. Atlantis jokes aside, this is actually a growing problem. While lackluster engineering has slowly (very, very slowly) doomed particularly heavy historical monuments like the Colosseum, which sinks seven inches every millennium, the more serious problem deals with rising water levels. According to recent satellite data, the global sea level is rising about 3.3 millimeters per year. While this may seem small, given enough time, certain cities will become submerged under water. We have already seen it happen (haven’t heard much from Lohachara anymore, have you? ), and with rising tides, small city-states are beginning to worry. In fact, the situation is getting so dire that the government of Kiribati, a small island nation in the South Pacific, has considered relocating. The solution: either deal with climate change or enjoy the new beachfront property. Researchers perform a drug test on a city by analyzing the microscopic contents of its sewer water. Image courtesy of EAWAT. Well, you probably knew that — but here’s proof. 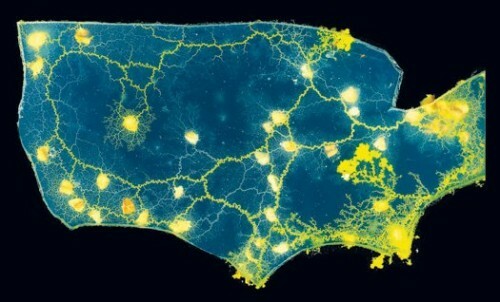 In a recent study, Japanese scientists plated bacterial slime molds on gels that had food sources proportional to the population of major cities. They discovered that the mold, equipped with neither a brain nor organs of any kind, created a network that resembled the painstakingly calculated Japanese rail-system layout. Biologically, this phenomenon is a beautiful demonstration of the efficiency of life. From an engineering standpoint, these molds may help future civil engineers help you avoid rush hour.